If your family and friends refuse to eat their veggies, don’t get mean, go green then! One sip and it won’t be difficult to charm with this deceptively delicious green smoothie. 2. Start you mixer on a low speed to start or if you have a smoothie button, go for it! 3. No smoothie button, no problem, just slowly increase the speed as the ingredients start to blend together. 4. 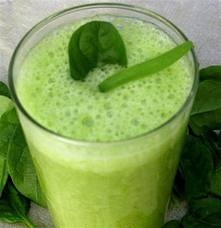 Blend for , oh about a minute Serve and enjoy delicious healthiness!! !